Crafty Garden Mom: Birthday Giveaway #3!! The best birthday gift was this year when I received a travel sewing machine. It is so nice to be able to leave my main machine set-up and just grab my bag with the smaller machine for classes. Thanks for the great giveaways. 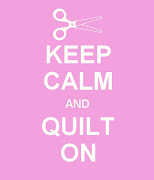 I saw Camille on The Quilt Show a few months back and really loved her quilts. A blue Schwin bicycle when I was seven!! I think my favourite birthday present was a photo of me and my late partner in a lovely frame - I am photo phobic and so I didn't think there were any photos of us together. Very special. thank you for the giveaway. My best gift was a double whammy .... My boyfriend knew how much I was dreading turning 37 (it was really starting to freak me about about 40 looming ahead) had arranged for my Mom & Brother to come visit unbeknownst to me. He tricked me telling me it was HIS brother and Mom coming to visit (so I woulnd't wonder about the cleaning frenzy) and we were at the airport with flowers and everything and it was MY family and I was a weeping smiling mess at the airport. It was the *best* gift ever! THE BEST BIRTHDAY GIFT I'VE RECEIVED WAS THE BIRTH OF OUR OLDEST DAUGHTER! THANKS FOR SHARING! I've got a December birthday which tends to get lost in the shuffle. A few years ago I decided that my son was old enough that I could leave him and my husband alone for a week so I took myself to Florida. Me time. A good thing. Have yourself a wonderful birthday!! best thing i ever got was a little cassette player i wanted sooo badly when i was about 11 years old but my parents made it very clear that that would not happen. And then i got anyway and was totally surprised and cried out of joy and everything. great giveaway, i would love that book, i was looking at it for some time now. We didn't make much of birthdays growing up so I was wonderfully surprised on my 16th birthday when my grandfather (Papaw) showed up with a cake covered & festooned with pink roses. It was gorgeous and I was very touched. 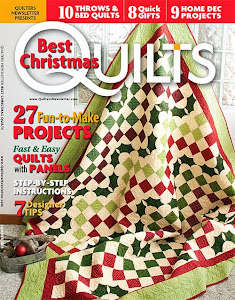 I absolutely love MODERN QUILTS and have been starting to collect MODERN QUILT BOOKS. We never exchanged birthday gifts when we first got married as the HOUSE / money pit ... always sapped up what extra money we had. We did go out to dinner as a couple, which since we had a daughter was a major undertaking. One year my hubby ( who does not cook) BBQed lobsters, corn, made a salad and bought a dessert from my favorite bakery. Our daughter had been farmed out to the neighbors for the weekend. So it was just the two of us. I loved that weekend. It was the last time we did something like that,cause the next year I had the care of my dad when he got sick. It was a memory of a special time. My favorite to date birthday gift was a cruise to the Baltic. So interesting and educational. Would love to have the money to take trips like this each year. For me, having a birthday is the best gift in and of itself. It means I've made it through another year of successes and maybe a few failures too...but I'm living and breathing and getting ready for the next year's adventures! The best birthday gift(s) I ever got were homemade cards by my kids - I always know how much thought and work they put into them. Happy Birthday tomorrow and thanks for the giveaways! My favorite and most memorable birthday gift was a swim mask and pair of fins on my 9th birthday. Growing up on an island I just about lived in the water all summer. I was finally able to explore a whole new world. The best birthday present: Some years ageo I returned from a weekend quilt retreat, my son and daughter had replaced an old worn out dishwasher and my son replaced my garbage disposal. As a single parent with limited resources at that time, I was overjoyed that they did that for me. I was truly surprised. I cried like a baby! My birthday is a week before Christmas so I always end up getting a combined present. Or someone will send a Christmas card and write happy birthday in it, that really peeves me…Anyway this is meant to be a comment about the best pressie and not a whinge! So, looking back I would probably say my serger that I got for my 21st. I'm 40 this year and it's still going strong! Thanks for the chance to win! For my 21st birthday my hubby of just a few months told me he was taking me to Los Angeles and taking me to dinner. We drove into LA, got on a plane and flew to San Fransisco for dinner! We had dinner at Alioto's on the wharf, walked clear across the city to get the bus back to the airport (because we kept missing the cable car and didn't have enough money for a taxi). Next March I'll be celebrating (maybe observing is a better word) my 60th (gulp) birthday. We've observed and celebrated a lot of birthdays together and that one so long ago still stands out. Oh, and all the guys at work were *really* mad at him for doing that. Best birthday present I've ever gotten - is actually a birthday card from my mom before she died when I was a teen. I know there was a present with it - I don't even remember what that was, but I sure treasure that card with her writing on it. I'll keep it always.